Here it is, the highly anticipated randomised controlled trial of open versus robotic radical prostatectomy published today in The Lancet. Congratulations to the team at Royal Brisbane Hospital for completing this landmark study. As ever, there will be intense and polarising discussion around this. One might expect that a randomised controlled trial, a true rarity in surgical practice, might settle the debate here; however, it is already clear that there will be anything BUT agreement on the findings of this study. Why is this so? Well let’s look first at what was reported today. This is a prospective randomised trial of patients undergoing radical prostatectomy for localised prostate cancer. Patients were randomised to undergo either open radical prostatectomy (ORP, n=163) or robotic-assisted radical prostatectomy (RARP, n=163). All ORPs were done by one surgeon, Dr John Yaxley (JY), and all RARPs were done by Dr Geoff Coughlin (GC). The hypothesis was that patients undergoing RARP would have better functional outcomes at 12 weeks, as measured by validated patient-reported quality of life measures. Other endpoints included positive surgical margins and complications, as well as time to return to work. So what did they find? In summary, the authors report no difference in urinary and sexual function at 12 weeks. There was also no statistical difference in positive surgical margins. RARP patients had a shorter hospital stay (1.5 vs 3.2days, p<0.0001) and less blood loss (443 vs 1338ml, P<0.001), and less pain post-operatively, yet, these benefits of minimally-invasive surgery did not translate into an earlier return to work. The average time to return to work in both arms was 6 weeks. The authors therefore conclude by encouraging patients “to choose an experienced surgeon they trust and with whom they have a rapport, rather than choose a specific surgical approach”. Fair enough. In summary therefore, this is a randomised controlled trial of ORP vs RARP showing no difference in the primary outcome. One might reasonably expect that we might start moth-balling these expensive machines and start picking up our old open surgery instruments. But that won’t happen, and my prediction is that this study will be severely criticized for elements of its design that explain why they failed to meet their primary endpoint. 1. Was this a realistic hypothesis? No it was not. For those of us who work full-time in prostate cancer, the notion that there would be a difference in sexual and urinary function at 12 weeks following ORP or RARP is fanciful. It is almost like it was set up to fail. There was no pilot study data to encourage such a hypothesis, and it remains a mystery to me why the authors thought this study might ever meet this endpoint. I hate to say “I told you so”, but this hypothesis could never have been proved with this study design. ORP arm: JY was more than 15 years post-Fellowship at the start of this study, and had completed over 1500 ORP before performing the first case in the trial. RARP arm: GC was just two years post-Fellowship and had completed only 200 RARP at the start of the study. The whole world knows that surgeon experience is the single most important determinant of outcomes following radical prostatectomy, and much data exists to support this fact. In the accompanying editorial, Lord Darzi reminds us that the learning curve for functional and oncological outcomes following RARP extends up to 700 cases. Yes 700 cases of RARP!! And GC had done 200 radical prostatectomies prior to operating on the first patient in this study. Meanwhile his vastly more experienced colleague JY, had done over 1500 cases. The authors believe that they controlled for surgeon heterogeneity based on the entry numbers detailed above, and state that it is “unlikely that a learning curve contributed substantially to the results”. This is bunkum. It just doesn’t stack up, and none of us who perform this type of surgery would accept that there is not a clinically meaningful difference in the experience of a surgeon who has performed 200 radical prostatectomies, compared with one who has performed 1500. Therein lies the fundamental weakness of this study, and the reason why it will be severely criticized. It would be the equivalent of comparing 66Gy with 78Gy of radiotherapy, or 160mg enzalutamide with 40mg – the study design is simply not comparing like with like, and the issue of surgeon heterogeneity as a confounder here is not accounted for. 3. Trainee input is not controlled for – most surprisingly, the authors previously admitted that “various components of the operations are performed by trainee surgeons”. One would expect that with such concerns about surgeon heterogeneity, there should have been tighter control on this aspect of the interventions. It would have been reasonable within an RCT to reduce the heterogeneity as much as possible by sticking to the senior surgeons for all cases. Having said all that, John and Geoff are to be congratulated for the excellent outcomes they have delivered to their patients in both arms of this study. These are excellent outcomes, highly credible, and represent, in my view, the best outcomes to be reported for patients undergoing RP in this country. We are all too familiar with completely unbelievable outcomes being reported for patients undergoing surgery/radiotherapy/HIFU etc around the world, and we have a responsibility to make sure patients have realistic expectations. John and Geoff have shown themselves to be at the top of the table reporting these credible outcomes today. To paraphrase that classic phrase of the Clinton Presidential campaign of 1992, this study clearly demonstrates that outcomes following radical prostatectomy are about the surgeon, and not about the robot. Yet one of the co-authors, a psychologist, comments that, “at 12 weeks, these two surgical approaches yielded similar outcomes for prostate cancer patients”. Herein lies one of the classic failings of this study design, and also a failure of the investigators to fully understand the issue of surgeon heterogeneity in this study. It is not about the surgical approach, it is about the surgeon experience. If the authors had designed a study that adequately controlled for surgeon experience, then it may have been possible for the surgical approach to be assessed with some equipoise. It is not impossible to do so, but is certainly challenging. For example a multi-centre study with multiple surgeons in each arm would have helped balance out the gulf in surgical experience in this two-surgeon study. Or at the very least, the authors should have ensured that they were comparing apples with apples by having a surgeon with in excess of 1500 RARP experience in that arm. Another approach would have been to get a surgeon with huge experience of both procedures (eg Dr Smith at Vanderbilt who has performed >3000 RARP and >3000 ORP), and to randomise patients to be operated on only by a single surgeon with such vast experience. That would have truly allowed the magnitude of the surgical approach effect to be measured, without the bias inherent in this study design. Having outlined these issues with surgeon heterogeneity and lack of equipoise, there is another angle which my colleague Dr Daniel Moon has identified in his comments in the Australian media today and which should be considered. Although this is a negative study which failed to meet its primary endpoints, it does demonstrate that a much less experienced surgeon can actually deliver equivalent functional and oncological outcomes to a much more experienced surgeon, by adopting a robotic approach. Furthermore, his patients get the benefits of a minimally-invasive approach as detailed in the paper. This therefore demonstrates that patients can be spared the inferior outcomes that may be delivered by less experienced surgeons while on their learning curve, and the robotic approach may therefore reduce the learning curve effect. On that note, a point to consider would be what would JY’s outcomes have been in this study if he had 13 years and 1300 cases less experience to what he had entering this study? Would the 200 case experience-Yax have been able to match the 1500 case experience-Yax?? Surely not. And finally, just as a footnote for readers around the world about what is actually happening on the ground following this study. During the course of this study, the ORP surgeon JY transitioned to RARP, and this is what he now offers almost exclusively to his patients. Why is that? It is because he delivers better outcomes by bringing a robotic approach to the vast surgical experience that he also brings to his practice, and which is of course the most important determinant of better outcomes. Sadly, “Yax” and “Cogs”, the two surgeons who operated in this study, have been prevented from speaking to the media or to being quoted in or commenting on this blog, but we are looking forward to hearing from them when they present this data at the Asia-Pacific Prostate Cancer Conference in Melbourne in a few weeks. Also that - learning curve appaers softened on robot. Thousands at open appears hundreds at robot. "Unknown knowns" not enough surgeons to comment on oncologic, erectile function and continence outcomes. Also no data on comfort of surgeon, reduced surgeon ergonomic injuries, increasing longevity of surgeons (robot cheap compared to training experienced surgeons) and also training aspects that are modular and data would suggest in other studies would appear safer in robot. So hats off to Queenslanders but the discussions have only really continued based on what we already knew. So much provided by them to stimulate discussion and think about going forward. Interest in this topic is declining in many countries, especially the USA, since fewer and fewer surgeons are performing open radical prostatectomy or even have the requisite skills and experience to perform the procedure with expertise. I have performed over 7000 robotic procedures and over 3000 radical retropubic prostatectomies. It has long been my contention that there are no differences in the primary functional outcomes of continence and potency (I have been disappointed by that) and any that do exist would not likely be manifest at 12 weeks. Less blood loss, a lower rate of bladder neck contracture, and a 99% probability of a single night in the hospital are established advantages of the robot. It is also my thought that moderate volume surgeons can more reliably obtain suitable results with the robot compared to open surgery. The advantages of robotic surgery are often exaggerated on websites and promotional and marketing sites and, as has been commented upon by many, the skills and experience of the surgeon trump the surgical approach. Very valid points Declan, but even ignoring the difference in experience between the two surgeons, it is difficult to see how the trial could have sufficient power to detect differences in oncological and functional outcomes based on about 150 patients per arm. There was barely enough power for the endpoints of peri-operative outcomes, where the differences are proportionately much larger. The study is commendable - one of very few surgical trials. It clearly confirms the accepted benefits of robotic surgery: less blood loss, fewer complications, quicker discharge. However, the assessments of surgical margins, sexual and urinary outcomes, are flawed for the above reasons. The economic analyses to follow are likely to favour the open approach. So, while this study doesn't resolve the debate, it yet again highlights that the robot is but a surgical tool, the outcomes of its use are dependant on the surgeon's skill and experience. A good analogy for urologists to consider is to consider equipment used for TURP at its inception versus now. Undoubtedly both methods achieved the surgical endpoint of relieving obstruction - but no surgeon would trade in the benefits of modern instrumentation in terms of ergonomics and morbidity - even if they maybe more expensive! 1. Sample size: the study design is crucial, and depending on the specifics of how the null hypothesis is conceived (non-inferiority, equivalence, superiority) will impact sample size. However if you take a "event" like a positive margin with a low rate of around 10%, power to detect a 5% difference requires hundreds more patients in each group. 4. The hierarchy of evidence does not always mean that a RCT level 1 study is automatically better than lower level evidence, in particular if poorly conceived and executed. 5. Yes, I'm a robotic surgeon. People may dismiss my remarks as resulting from my own biases. I don't particularly care about the study conclusion, because frankly this ship has sailed. I'm bothered most by the flaws of this RCT, and the fact that most will gobble it up without digging into the details. Just like real estate is location, location, location, I fundamentally I believe surgical results are dependent on the surgeon, the surgeon, the surgeon. I would also like to congratulate Drs Coughlan and Yaxley on undertaking such a brave and ambitious project. Bottom line is you can't control for the complexity of the individual surgeon. So many micro-decisions being made throughout the course of any given case that all have a bearing on the outcome. No doubt the reason RCTs in surgery are such a rarity. Fair to say if you have an experienced, competent robot surgeon you can be optimistic about a good outcome with your surgery; likewise if you are in the hands of an experienced, competent pelvic surgeon. But didn't we all know that anyway! Great summary of the study and of the issue. Fundamentally, I think the author's conclusions are correct: "we encourage patients to choose an experienced surgeon they trust and with whom they have rapport, rather than a specific surgical approach". However, this doesn't negate the potential benefit of a robotic approach. This may prove controversial, but this study highlights for me the limitations of RCTs. In principle, RCTs should be considered the "top of the evidence food chain" on in so much as decisions made based on data from randomized controlled trials result in better outcomes than decisions made on observational data. However, this has not been demonstrated (Williams BA. Perils of evidence-based medicine. Perspect Biol Med. 2010;53(1):106-120). While the use of a randomized design in this study has solved some of the concerns regarding the comparability of patient cohorts, it has (as others have outlined) introduced others. Many of the concerns regarding this study are addressed by the use of large population-based dataset (as were used by Pearce et al. : https://www.ncbi.nlm.nih.gov/pubmed/26860793). However, such a study design introduces the potential issue of residual differences among patients treated using open or robotic approaches. As Dr Murphy points out, the ideal study would either involve many sites and surgeons in each arm or a single surgeon with comparable experience in both modalities. However, neither study is likely to be undertaken. I think this study should reassure experienced surgeons who feel most comfortable offering patients ORP based on their strength of experience and should encourage younger surgeons that RARP can allow them to offer very good outcomes to their patients, even during their learning curve. The discussion on this paper comes down to a matter of interpretation. Whereas some will say that the study shows that RARP isn't better than ORP, I would beg to differ. The 'golf standard' is supposedly open surgery, and we have always strived in robotic surgery to mimic the open operation, but with a minimally invasive approach. It is difficult to have better functional and oncological results than can be achieved by a vastly experienced open surgeon, but what we do see very definitely is that RARP is much less traumatic for the patient than ORP, as measured by blood loss and length of stay. Losing an average of 1,300 mls of blood in 60-120 minutes is not advisable for anyone, and likewise, as a patient, surgeon or health economist, a shorter inpatient stay is obviously much more desirable than the alternative. When laparoscopic cholecystectomy was introduced, the advantages seen were not in terms of the outcome of performing the operation, but in terms of it being much less traumatic to the patient. 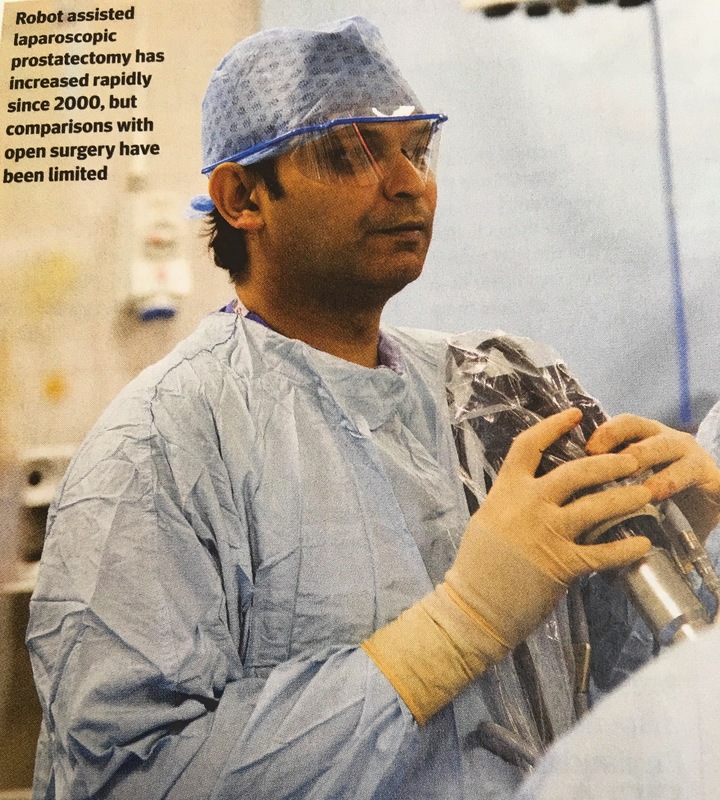 In a similar vein, I was the principal investigator in the first randomised trial comparing PVP/Greenlight prostatectomy against the 'gold standard' of TURP. What we showed was a non-inferiority in terms of functional outcomes, with much less blood loss and a decreased hospital stay. We concluded, I believe correctly, that overall PVP was superior to TURP because of these better secondary outcomes and equivalence of primary end points. I believe the current study shows the exact same thing, in that RARP is, at the very least, as good as ORP even in less experienced hands, but that it is much less traumatic for the patient, much less likely to need blood transfusion post operatively and needing the patient to spend considerablely less time in hospital. This, in my humble opinion, shows that overall RARP is superior to ORP. It's all about interpretation, I suppose. In summary, 'beauty is in the eye of the beholder'. I'm sure this discussion will run and run, but I must say I don't know of any surgeon who has transitioned from open surgery to robotic surgery, and has transitioned back in the opposite direction to open surgery. I think that alone says a huge amount about where we currently stand in relation to robotic surgery. 1. One has to congratulate Frank, Nigel, John and all for completing a prospective RCT when others have not. The powering is always a balance between ideal and achievable. Peter Nichol always said if it took more than n=4, then the difference was of limited clinical benefit. So, why do most surgeons +\- patients choose the robot? Are we missing the benefits through using the wrong endpoints or are we asking the wrong person? Surgeon fatigue studies after 1,2 or more RPs would surely show a difference. Regardless we should congratulate this team and try to develop studies that could answer why we choose robotic surgery. Not trying to offend anyone but are we saying that "a fool with a tool is still a fool" or that "a tool with a fool is still a tool"? Mixed feelings about two of our own robo trials. The LOPERA study of prostatectomy failed to recruit. The CORAL study of cystectomy was very difficult but recruited and reported. Essentially a negative study again. Sadly the NHS is not commissioning robotic cystectomy unless under evaluation! And in parallel to this we have the Mercedes Benz analogy from my colleagues in the BJUI reminding us that new cars continue to get better without trials compared to the old ones. Perhaps our obsession with surgical trials and their design is largely flawed. Patients today are knowledgeable, consult Dr. Google and make their own decisions - trials or not. a RCT between two surgeons. One has more than 7 time the experience of the other. the younger, thanking to the robotic assistance reaches the same functional and oncological results, with less bleeding and shorter hospitalization. Conclusion: experience matters. Robotic assistance is able to fill a consistence experience's gap. Many congratulations are due to the authors who have succeeded in completing a randomised controlled trial in surgery, a very rare beast indeed! I am hugely impressed by the quality of the surgery with positive margin rates of only 2% (Open RP) - 3% (RARP) for pT2 tumours. Its a shame the results were embargoed at EAU and AUA but I'm sure debate over this study will dominate the plenary sessions at the Asia-Pacific Prostate Cancer Conference in 5 weeks time. RARP men had less pain, lost less blood, needed fewer transfusions, had much shorter hospital stays and fewer complications than ORP cases. (this is Dogma, no debate here). RARP was NON-INFERIOR to the gold standard of ORP in terms of oncological and functional outcomes despite being performed by a surgeon much earlier in his career/along his learning curve than the vastly more experienced open surgeon. Most interestingly, RARP was quicker and retrieved more lymph nodes than ORP! (Criticisms often thrown at RARP include 'its too slow, uses up to much expensive OR time' and 'you can't do a decent node dissection with the robot, its a suboptimal cancer operation': both of theses concerns have clearly been refuted). I wouldn't be as pessimistic as Declan in saying the trial has failed simply because it hasn't demonstrated superiority for RARP in certain parameters. Indeed, 20 years on from the scathing Lancet editorial of Richard Horton "Surgical Research or comic opera: questions but few answers"I believe this paper would give the former editor food for thought. Its not perfect but it marks significant progress in planning and executing a surgical trial. I'm no statistician but overall numbers were low and the trial was underpowered. Over the course of the study between the 2 surgeons over 1300 radical prostatectomies were completed (800 RARP, >500 ORP) but sadly only 308 men participated reflecting the real difficulty in recruiting to a surgical trial. I agree with Declan that the ideal trial would be multi-surgeon, multi-institutional but recruiting to such a study in real life clinical practice is all but impossible. The NHS is probably the healthcare system best placed to deliver such a study (note the success in recruiting to PROTECT), but as Prokar points out, the LOPERA study was a non-starter. The wisdom of comparing a robotic surgeon 2 years post fellowship with an experience of 200 cases with an open surgeon 15 years post fellowship with 1500 cases performed will be questioned at length. This discrepancy may have been relevant early in the study but the robotic surgeon rapidly gained experience, performing over 800 cases in just over 4 years. With this concentrated high volume experience it is likely his learning curve plateaued reasonably early in the study as reflected by a pT2 positive margin rate of 3%, a reasonable proxy for surgical excellence. I am a recent (2014) convert to robotic surgery which remains largely confined to the private sector in Ireland (troubled by inequity of access, my colleagues and I convinced the public sector to fund access to robotic prostatectomy: currently 50 public cases per year are funded in our region). I was trained by 2 Melbourne Robotic Fellowship Trained Surgeons (David Bouchier Hayes and Paddy O'Malley), proctored and signed off by Ben Challacombe in January 2015. I have done over 300 open RPs (and continue to do so for selected cases) and over 450 laparoscopic RPs, the procedure with the mother of all learning curves! I did my last lap RP in May 2015 and I'm not for going back! Before converting to the robot I was rapidly accumulating MSK problems, neck and back pain, regular visits to the physio and munching through NSAIDs. Lap RP was good for my patients but bad for me! I believe the robot will prolong the operating life of a surgeon due to its superior ergonomics, something that is unquantifiable. As Nathan points out its far easier to replace a broken robot than a broken surgeon! The nurses I work with claim they can tell the difference between an RARP patient and an ORP patient the minute they step into the corridor leading to our clinic. Feedback from patients has been uniformly positive and although I've only done about 130 RARP cases to date, pT2 margin rates are under 10% and return to continence seems more rapid. Cost remains a big concern for the payers, especially in a broken healthcare system like ours ravaged by austerity and a recent recession. We will continue to fight for access to robotic prostatectomy for all our patients but I am concerned that senior management may seize on the message that robotic prostatectomy offers no benefit in terms of functional recovery over open prostatectomy as an excuse not to fund or develop robotic surgery. Sadly in Ireland in 2016 the majority of prostate cancer patients still have no access to robotic prostatectomy and radiotherapy remains the commonest primary treatment. Great blog Declan, and great comments from many colleagues. No difference at 12 weeks is unsurprising. An analysis at 12, 24, 36 and even 48 months would have been much more revealing. If the da Vinci robot wasn't infinitely superior to the original open approach many of the high volume radical prostatectomists around the world would have abandoned the machine and gone back to their old ways. I can't think of a single one who has. We don't actually need a trial to tell us the answer, we just need to get access to a robot! Incredible study. Impressive to actually pull it off. Of course this should be in the Lancet. Current discussion is intriguing. What we know: robotic surgery is better. What we need to find out (to convince authorities): why is it better? Conclusion of RCT: In super-experienced hands the only (!) difference is faster recovery, less blood loss and shorter hospitalisation. That does not seem to be enough (Australian Financial review - expensive robotic surgery not worth it). Major flaw of the RCT: Participating surgeons are too good (you can't really call "Cogs" who was fully trained by Vip Patel average). 1)	Because it diminishes individual skill differences. The surgeon, the surgeon, the surgeon. Agree. Centralisation is the most straightforward way to improve results be it oncological, functional, cost, ... In the meantime however … there is little to learn from future randomized studies comparing surgeons with an experience number that contains 3 zeros. The majority of surgeons in my country performs 1 prostatectomy per week and only reaches these 3 zeros at the end of their careers. Aim should be benefit for the majority of patients which means we need to compare the average rather than the expert surgeon. In the US this comparison showed less surgical margins, less postop radiotherapy and less mortality after RARP (Pearce, J Urol, 2016). 2)	Because RARP is easier to teach than open radical prostatectomy. What we lost in tactile feedback we gained in sight. And sight is more useful in teaching. When standing with my both hands in the small pelvis trying to peel off the nerve bundle the expert open surgeon anxiously asked ‘Are you sure you feel it?’ During a RARP nerve spare the robotic boss saw me leaving one nerve fiber on the prostate and said ‘That is not how I do it, let me show you’. Prospective learning curve comparison would therefore be interesting … but where to find urologists starting an open series to compare my recent first 6 RARPs to? I personally think that we too much think that a RCT is the gold standard of the best evidence (Level 1). In surgery, it's very difficult to recruit patients for these studies. The MSK trial (Bochner et al) RARC vs ORC included 124 patients. Out of 617 patients, 145 were excluded because of exclusion criteria and 354 DECLINED to participate. So there's a selection bias. To compare outcomes that matter for the patients you need a longer follow-up, also for re-treatment and oncological failure. This study, in my opinion, shows that a talented young surgeon can save a lot of blood and hospital days for prostate cancer patients. This is due to a shorter learning curve of complex surgery. What about the overall quality of life? What about the costs (out of pocket expenses for example) for ORC and RARP? Evidence based surgery is not the same as evidence based medicine. We no try to compare outcomes of robot assisted radical cystectomy and open radical cystectomy in our RACE study. It's NOT a RCT. We think it's better to compare best practices of ORC vs RARC. And we try to exclude centers which are in their learning curve (if we now how it looks like for RARC, but > 40 for now). More surgeons, more teams, more hospitals. We'll measure oncological outcomes, but more important; costs (also out of pocket expenses), complications and QOL. For now I've to congratulate the authors with this paper ("RARP provides same results as ORP with shorter learning curve!!") and I agree with your comments Declan! There are not likely to be many more RCTs of Open vs Robot RP as equipoise has gone for many. Clearly this trail of 1 vs 1 surgeon is as much about the surgeons as it is about the technology. Functional outcomes at 1 year would have been nice to see. Not enough on bladder neck contractures which might have been an interesting comparison. A multi centre national audit such as the BAUS RP audit might be able to answer the question more effectively despite not being an RCT. My take is choose your surgeon wisely but as there aren't any in the UK doing high volumes of open RP left, choose your robotic surgeon wisely. Wow. Explosive paper and great blog. Certainly agree on congratulating the authors and all others who worked on this trial. A mention to the patients as well who agreed to be randomised - something that has failed with other attempted trials in other countries. 1) Everyone commenting on here is a robotic surgeon and bound to pick up on the negatives of the study. 2) If this had shown benefit to RARP, the same people would be swooning all over it saying "I told you so..." with no mention of methodological flaws. 3) Murphy says it is not a realistic hypothesis. But what time point is then? If the authors had chosen outcomes at one year, he would be saying that it is the "early return to continence/ erections that are better with the robot - the authors should have chosen an earlier endpoint!" 4) Surgical experience - sure this could be a factor. But don't we hear all the time that fellowship training shortens the learning curve. That when you finish the fellowship you are ready to go with independent practice. Errr ... unless you are in a trial we don't like the outcome of it, in which case its not true! 5) Trainee involvement - this may have been a factor. But it may have weakened the ORP arm. My experience of working in Australia was that the open cases were trainee/ fellow cases with consultant supervision while robotic cases were consultant only or consultant with fellow to assist. This may have changed but I suspect this affected the ORP group more than the RARP. And this trial is not in isolation. Jim Catto points out the Swedish data above. Similar outcomes. And then there is the Bochner cystectomy RCT showing no benefit to robotics in cystectomy. But of course this is all explained away by the Roboteers as "less experience in the robot arm" "its amazing the robot arm did so well against expert open surgeons" etc etc. The same arguments as here!! Anyway ... just a contrary view from a stone surgeon. I'm off to get my PSA checked. If I need my prostate out, regardless of this trial, Murphy can definitely dock the robot for me! A great blog Declan. This paper is certainly worthy of much debate. Of course the authors of the paper and even to a greater extent the patients that participated in the study are to be applauded. An RCT in surgery are a rarity so this is a great achievement. However, the study in essence compares one surgeons outcomes with that of another - albeit in a randomised fashion. As such one can not take the results of this two surgeon comparative study and make conclusions on the provision of health care services as a whole. One advantage of robotic surgery in the uk has been centralisation of care to high volume centres. There is no doubt that such centralisation is of great patient benefit given that it has been demonstrated over and over again that surgeon experience has a direct correlation with outcome. without centralisation and sub specialisation surgeons will rarely get to overcome the surgical learning curve enabling them to provide patients with the best outcomes. On this issue, There is no doubt that going forward initiatives such as the BAUS surgeon outcome reporting database are crucial in raising the bar for prostate surgical outcomes irrespective of surgical approach. The Current issue with Robotic Surgery remains the cost. If Robotic surgery was cheaper than open surgery we would be applauding equivocal outcome results. Congrats to Queensland team for a completing this study. It is a reflection of where we are but not where we will likely be. In the future computer assisted ('robotic' terminology incorrect) will deliver big data analysis and the argument for open (old school) vs computer assisted surgery will be as relevant as discussing the comparative benefits of transatlantic flights pilots. Modern pilots with auto-pilot, 'backup' guidance technologies and with additional support from control centres being compared to highly experienced pilots who pioneered long distance flying. Both will have their place in history and rightly so. Congratulations to the Brisbane team who have performed the study that everybody for years has said would be impossible. With the horse having bolted with the robotic approach, I cannot see a similar study every being performed nor the abandonment of robotic surgery in favour of a return to open surgery. Declan makes excellent points about surgical experience but then again if a surgeon with a significantly lessor experience can match a master at his trade in using robotics, there is something to be said about this. The reality is that many of the the surgeons performing open or robotic radical prostatectomies do not have anywhere near the current caseload of Yax and Cogs. The non-inferiority results from this study may not necessarily translate to the vast majority of punters who do not perform any significant volumes of radical prostatectomies. We have to accept that we are still a quite a way off from their being appropriate full subspecialisation/regionalisation of prostate cancer surgery. It has been my personal impression that robotics helps lift many B grade standard open surgeons to achieve close to A grade robotics outcomes but an A grade surgeon will achieve A grade results irrespective of the tools placed before him/her. If the overall standard of radical prostatectomy is to be lifted, surely that cannot be a bad thing. I also wish to congratulate the Brisbane team on finishing and reporting on this RCT, and as comments to date and been from robotic surgeons I thought I'd make some comments as an open surgeon with 25 years experience in ORP with over 3000 cases performed and with documented good functional results based on independent registry data. That's my disclosure . As such some of my comments are both personal and biased. Firstly I don't think that this trial was ever designed to stop the dissemination of RARP but rather determine the true benefits of RARP over open surgery given the relentless marketing by companies, hospitals and urologists. I agree with previous comments that the ship has sailed and RARP is an excellent operation, no question. It may well be easier to teach and may reduce learning curve as per previous comments. To me the questions are whether a patient living in a region that doesn't have a robot readily available needs to chase one to get a quality outcome and secondly what does the experienced open surgeon , like me, getting good results do to remain relevant in 2016 and beyond. This trial result isn't in isolation as previously mentioned . In fact even in the very early literature by Jay Smith , comparing his open and RARP results when he was experienced in both techniques, he showed a LOS difference of only around 0.2 of a day and no functional differences. So these current results are not surprising really. Whilst the experience of the 2 surgeons were different in this trial which has been criticised, how do we know that the surgeon having done 1500 cases was performing better then he was after 200 cases? We really don't know and there is clearly inter surgeon variability even using the same technique. If fellowship training and 200+ cases isn't over the learning curve then basically 90% of urologists currently performing RP will ever achieve full competence in either technique during their career so how do we credential for this surgery? Similarly a transitioning open surgeon will have to accept sub optimal results by their own standards for many years before getting back to their own status quo if the learning curve is that long . Is that appropriate or fair for patients ? Yet open surgeons are transitioning and I suspect so will I, but why is that? With regards as to why open surgeons transition - it is largely due to the relentless marketing that RARP is a vastly superior procedure , and the fact the open surgeons ss a result of that marketing, still want to have a Prostate cancer surgical practice 5 years from now. Realistically that may well be why I change too , but am I worried about harming patients - absolutely! There may be other factors such as ergonomics and comfort as well but I have not heard an experienced open surgeon say their results are vastly better since the transition. So to answer my questions - based on this study if there isn't a robot available then patients should be reassured that a well done open procedure performed by an experienced surgeon will give largely similar outcomes . This may not be relevant in the USA, UK or Europe but is relevant here in Australia. For a young urologist it is a no brainer to become proficient in robotics . What should an experienced open surgeon do ? In my opinion, albeit biased, they should be encouraged and supported by all urologists including robotic surgeons to keep doing whatever gives the patient the best outcome as the patient should come first always. There is little doubt a well done open procedure will give better results than a poorly performed robotic case and vice versa. As has been mentioned repeatedly it is the surgeon that counts , not the robotic platform, and I think its time as a urologic community we stopped focussing on open vs lap vs robotics but rather concentrate all our efforts on measuring and constantly improving patient outcomes no matter how the surgery is done. These headlines are priceless- here's another great one from Medscape: "Robot vs Human Prostatectomy: It's a Tie, at Least So Far." The robots are taking over! Who even needs a urologist? 1. To echo Jim, robot definitely easier on the surgeon. I like to say that Open Surgery = "blue-collar" surgery (back-breaking sweat), while Robotic Surgery = "white-collar" surgery (sit at a desk and twirl joysticks). Arguably an advantage. 2. No doubt in my mind in expert hands, physiology of removing prostate is largely same regardless of approach (and if different, it will be quite hard to show), but I agree with Dan's point that the these data suggest that the robot likely gets one proficient much faster. 3. One HUGE advantage of robot that is rarely mentioned is lack of bladder neck contractures. This was a major problem (that was not-infrequently life-long) in the "open" days and is now basically non-existent. 5. Robot not going anywhere for many reasons, not the least of which is the fact that trainees from last decade (at least in US) have not been trained in open prostate surgery. 5) If willing to share, why didn't Dr Murphy participate in trial so that both arms were balanced in regard to surgical experience? Great points Scott! I actually operated on one of the patients randomised to open surgery in this study. The way the study was set-up, the only way a public/uninsured patient could get RARP in the State of Queensland, was to agree to be randomised. The HREC approval supported this. Clearly, some patients randomised to open surgery pulled out after drawing the ORP straw and my patient was one of those. He does not seem to be fully accounted for in the current paper as they report that three patients randomised to open surgery opted for "private robot surgery" instead. But my patient underwent surgery as a public patient in Melbourne as Peter MacCallum Cancer Centre offers RARP without fees to public patients and he could not have afforded private surgery in Brisbane. In any case, my total experience performing RARP is just over 900 cases, so I would still not consider myself to be on the same experience level as John Yaxley who had performed >1500 ORP before the start of the study. First and foremost the authors are to be congratulated on setting up such a study and to follow through with it till the end as this is not a small undertaking from the A to Z.
Declan has got the review spot on and perfectly timed. As it has been so elegantly put by my victorian colleagues the robot appears as it has fast forwarded the young surgeon some 15 years over the period of 2-3 years and this is the most important thing to be taken away from this paper, although for less talented of us the number might be longer but it is probably still less than 5 years and certainly less than 15. For those who will be quoting this paper as a negative study promoting open approach the caveat would be the number of open experience and unless one has more than 1000 cases under their belt, then probably not logical to pursue this avenue. For years we have heard that robot lacks hapatic feedback and one can not “feel the cancer” in order to be able to do a wide dissection or do a good nerve spare etc, naturally this question seemed to have been answered here. Overall the findings are not surprising at all and is not something that we didn’t know, the majority of big data publications has shown the same. As the time goes by the volume and the results of open surgeons will also go down and in places such as US it is a self fulfilling prophecy that the results of the robotic surgery is going to be far better than open as the expertise with the open RP is going to disappear. As some one with fellowship training in open and robotic RP, I must say that the length of stay in open RP could even be shorter and even that is something that the two arms could be similar in but despite this considering the ergonomic comfort of robotic RP (something less talked about), better vision as well as findings of this study (less EBL, shorter learning curve) robotic approach is here to stay and we should all focus on proving this technology to all interested urologist and patients alike. Speaking as a statistician, I don’t believe there are any glaring errors in this paper. Congratulations to the authors for running a successful study. The authors report it was powered to detect an effect size of 0.5 in the primary outcome measure and this is not unreasonable. Increasing the sample exponentially to detect a small, likely clinically insignificant difference is unethical. And I think we misunderstand the term equipoise as it relates to trials. That is, we are unsure which of the treatments confers the most benefit (harm) prior to the study. At around 200 robot cases, it has been shown the functional outcomes are similar: https://www.ncbi.nlm.nih.gov/pubmed/24287319 ; hence there is equipoise. There are 6 vs. 1 patients who required a transfusion and 5 vs. 0 who required an unplanned ICU admission (p=0.12 to 0.18). Are we so callous as to believe these differences are not “significant”? There were 7 vs. 1 Grade III+ preoperative complications (p=0.052). That’s a bit too wide a gap for my liking, regardless that the p-value is not below some mythical value. Would a drug trial accept that difference in adverse events when the primary endpoint results are comparable? And importantly, were these patients surveyed for the primary endpoints? Maybe this is where the focus should lie rather than learning curves. The point of the study is short term functional outcomes and the authors correctly focus on this. But the peri-operative outcomes are explained away too easily by a “non-significant” p-value. In passing, I mention that perhaps the mainstream press could just have easily focussed on the “700% difference” in major complications, the “600% difference” in transfusions. The higher early pain scores. The poor grandpas unable to lift their grandkids for a month following an open procedure. Data itself is silent, we write the narrative. The problem with a study like this that is not methodologically bulletproof is that it allows us all to be reassured in our pre-existing personal bias. I perform both open and robotic prostatectomies due to the public/private arrangement in our environment, and of course good results can be achieved both ways. From personal audit, I know that I get better early continence, erectile function, and oncological margins with a robotic procedure, thanks to a Fellowship year in robotics. This study, Patrick Walsh's series, or Vip Patel's series are irrelevant to the patient in front of us. Only our own outcomes matter. It concerns me that surgeons early in the robotic learning curve will "sell" the procedure to a patient based on how well another surgeon can perform the procedure. I can only imagine the consent process that an experienced open surgeon goes through with a patient when transitioning to robotics; "Yes, I could get superior outcomes with the procedure I'm experienced in, but I'm keen to be a part of a new trend and so unfortunately you will be punished for this". The authors deserve congratulations for completing their study. Despite it's obvious limitations, proponents of both open and robotic prostatectomy can draw positives from the results, as can be seen from comments already posted. The fact of the matter is that nothing will halt the progress of technology and particularly robotic surgery. Urology has been the pioneering speciality for robotic assisted surgery, and will endure more than its fair share of criticism. But as more robotic platforms enter the market in the next 5-10 years, virtually all surgical disciplines will benefit from advances of minimally invasive surgery. As a robotic surgeon who proctors surgeons in robotics on a full time basis, I have seen the benefits of technological advances in training surgeons both young and old. Robotic simulation, video based case review and viral dissemination of new tips and tricks via professional and social media (to name just a few) has been a game changer in training surgeons. There is no going back. As was demonstrated in this study, excellent outcomes with minimal morbidity can be achieved from early in the learning curve with appropriate training and proctoring. Certification and credentialing is the key to success, as is surgical volume. How come the authors can't comment? Surely the journal can't do that once it is published? Doesn't the embargo get lifted on publication? Lots of discussion taking place on this blog and on twitter. Isn't it important to hear from the authors viewpoint/ response? Is open prostatectomy still taking place in Brisbane? If not why not in light of this trial etc etc. Thanks Matt. I invited John and Geoff to contribute to the blog a few weeks ago after I had seen the full paper. However the author group had already decreed that all public comments were to be directed through other authors for some reason. Great blog. Sorry my institution firewall seemed to have killed off my comment yesterday. Two points. 1: the Intuitive story is a good example of the need to encourage device companies to fund RCTs early in the launch with the right question and setting. The benefit is that the produce could go to guidelines and competitors would have to match the science. All ships rise. 2: would still be a good exercise to determine what would have been the best trial design that would be definitive. Congrats to the authors. Great blog and comments Declan. One for the record books. This study has been long awaited, and like all before me, I congratulate Geoff and John along with the team in Brisbane who have been able to conduct such a study to completion. Very well written and compelling blog Declan and I agree entirely with the points you make. Lets not lose sight of the fact that essentially all the robot has given us is better vision, finer and more dexterous instruments, and a comfortable seat. What more could a surgeon want?? All in a laparoscopic approach that will unequivocally yield generic advantages of a minimally invasive procedure including reduced bleeding, reduced peri-operative complications, reduced pain, and (as Alex Kutikov has rightly pointed out) close to zero bladder neck strictures. It is a no brainer that the more intricate details of the surgery, and subsequent long term outcome measures will depend largely upon how these tools are used and in who’s hands. There are a myriad of published and unpublished data and registries (for example in Australia the Victorian Prostate Cancer Registry) which report independently collected results and there is no cluster of “open” and “robotic” surgeons on the graphs – just a scattering of outcomes dictated by surgeon experience and expertise. Sadly the debate becomes tainted by the following environmental factors that can then be used by those with alternate agendas to steer this whole discussion away from the core facts above, and indeed often away from the patient at the centre of this who should be the chief priority. While the health economics varies from country to country, in Australia the often dramatic difference in costs of robotic surgery to patients, hospitals, and insurers is a constant presence, and demands that a significant benefit can be demonstrated to justify the expenditure. Unfortunately as we are already seeing, a trial that confirms the surgeon, rather than the technology, is control of many of the measured outcomes does not satisfy many who feel that the cost of robotics is too high. Unfortunately it doesn’t take much trawling through websites on the internet to see that surgeons can be their own worst enemy when it comes to building up unrealistic expectations. Not only does this simply paint a target on the da vinci system, but I see in the US has led to the birth of robotic lawyers who can seemingly make a career out of finding patients who feel they are let down when an adverse outcome follows the promise of a perfect result. No established surgeon wants to see a new technique/technology they are not privy to, challenge the status quo. Lets not forget the mini-lap cholecystectomy trial that demonstrated equivalent results to the up and coming lap chole – did that lead to a widespread abandoning of laparoscopy??! We are also seeing resentment from other specialties to the dissemination of robotic surgery – there is noticeable hostility from certain radiation oncology corners in Australia who feel that the benefits of robotic surgery are oversold and now are rubbing their hands with glee watching the fallout from a trial that has seemingly demonstrated no significant long term advantage. Robotic surgery is an incredible advance in laparoscopy and is here to stay. If it is simply called for what it is, without the evidence-free websites and billboards, is costed appropriately, and introduced in a collaborative environment, hopefully we can move forward and devote energies to more productive debates on prostate cancer management. Not enough has been said about the role of industry here. For sure, Intuitive Surgical have developed some very nice technology in the da Vinci Surgical System. They have also made an enormous amount of profit from this, and after 16 years, they remains the monopoly provider. If the technology was not still so expensive in terms of capital, maintenance and instrument costs, then this area would not be so contentious. Imagine if the incremental cost (including capital etc) was $1000? Would there really be so much of a fuss? There is no fuss about using Ligature etc as the penalty is not so severe, and at the day this is just just a technology, albeit more complex. The subsequent health-economics papers arising from this Brisbane study will send a shudder through the industry and may well torpedo programs in regions where we struggle to fund this type of surgery. The industry may need to take a hard look at their role in making the value proposition more palatable. We love to extrapolate, but this isn't always wise or valid. As several contributors have already pointed out, the huge and uncontrollable confounder in a study such as this is surgical ability. Yes, it's certainly possible that RARP is easier to teach than ORP and also that RARP might allow surgeons to achieve good outcomes earlier in their learning curve than ORP (we all feel this intuitively) but it is also possible that this isn't the case at all and that we've been lead to this conclusion solely because one surgeon in this study is better than the other or perhaps just better at robotic surgery. The conclusion of this and other similar studies allows us to draw conclusions only about the techniques used in the hands of the surgeons who used them. Everything else is extrapolation. We can all list outstanding open and robotic surgeons who we'd be happy to allow operate on members of our families but what about the average surgeon? I think that we've yet to settle this but as Nathan Papa pointed out, the advantages of using a minimal access approach for RP, highlighted in this study in the form of the large differences seen in transfusion, ICU use and serious complications rates, are impossible to ignore and for me at least are the greatest vindication of the continued growth of minimal access RP. Congratulations to all involved in the study - an amazing achievement in this era. I can't add much to this discussion that hasn't been said already. 1. Of course, RCT's investigating surgical therapies should always been commended, and based on my brief experience, the discussion they create is as valuable as how the trials themselves contribute to the literature. 2. The limitations have been stated in detail. This study should be reflected as surgeon vs. surgeon rather than a comparison of approaches. Case volume and degree of specialization are both of huge importance, the trial surgeons vary considerably on these parameters. 3. I feel (and again, my understanding pales in comparison to many in this discussion) the true value of robotic surgery has yet to be revealed. The plateau of surgeon skill in robotics continues to climb as more 'robotic-native' surgeons graduate from residency programs every year. The technology surrounding technical skill simulation continues to evolve, and these advances will continue to shorten the LC for trainees. Additionally (as its been stated previously), surgical robotics is a platform that has the ability to integrate future innovations, not just in fields like medical imaging and robotics, but also virtual/augmented reality, telesurgery, and video analytics. It is through continuing technological advancement that the true benefits of robotics will be realized. Although the evidence at this time doesn't overwhelmingly support robotic surgery in all respects, I think it would be a mistake to limit the use and availability of this technology in training. First off, I would like to congratulate the research team for accomplishing a randomized surgical trial. That's no easy task! Many of the limitations have been discussed and don't need repeating. However, I was thrilled to see that a less experience robotic surgeon was able to produce similar result as the more senior open surgeon. This could be the result of a gifted surgeon or perhaps demonstrates the advantage of the robotic approach for training the newest generation of residents through better visualization of key anatomy thereby resulting in a shorter learning curve. In open radical prostatectomy only the surgeon and occasionally the assistant get to see the operative field, but with the minimally invasive approach everyone in the room can now experience and learn from the surgeon. I always tell my patients that it is the surgeon's experience, not the approach that is responsible for the outcomes, with biology of the disease being a close second. I believe robotic prostatectomy can provide a very consistent result for the patient. Not to mention it is more comfortable, it can all for improved teaching, there is less blood loss, less immediate post-operative pain and, as in this study, a lower risk of complications (although not statistically significant). Given the approaches result in similar outcomes I, and apparently Dr John Yaxley who switched to RALRP, will choose doing it robotically every time. To paint GC, the robotic surgeon in Brisbane, as a fledgling is a little disingenuous. My reading of his CV is Laparoscopic fellowship at St Georges; 2 years fellowship training in Florida at one of the highest volume RARP centres in the world under the tutelage of the acknowledged master, Vip Patel; 200 RARP's pre- trial; and > 150 RARP's per year during the trial period. This was not a surgeon 'early in his learning curve'. Less bleeding, less ITU, less complications look to me like good reasons to have a RARP but the question remains 'if functional outcomes and margins are no different, why should taxpayers fund expensive machines ( & upgrades ) from a monopoly provider ?' Just as effective might be to only fund and allow surgery to be performed by experts in high volume centres. The latter would at least also put us in a position to test more effectively and more quickly the next waves of technological innovation which might be even more expensive and just as strongly marketed ! Let me start by adding to the quote of Wouter Everaerts, that I didn’t retire, but recently stepped down as chairman of Urology at the University Hospitals Leuven, where I’ve performed over 2500 open radical prostatectomies. I’m still performing open prostatectomies in other university hospitals in Europe and community hospitals in Belgium and Eastern European countries and I’m still very pleased with the results of my surgery. When I’m (ab)used to defend the case of open surgery versus the robot, I will always acknowledge the short term advantages of minimally invasive (robotic) surgery including decreased pain, blood loss and shorter hospital stay. When it comes down to oncological results of surgery for tumors that really need it (high risk), the results obtained by open prostatectomy, eventually in combination with radiotherapy and hormones are reported as cancer-specific survival at 15 years. We still need to see how the outcomes of the different techniques compare not only at twelve weeks and not only at a functional level, but from an oncological point of view at 15 years. Currently there are no such data yet from large robotic series. I sincerely hope they will come and prove to be equal to open surgery. Let us be fair to all patients and urologists who don’t have access to robotic surgery, now or in the future, to reassure them that given they get treated in high volume centers, they will obtain excellent oncological and functional results for a cheap price if they undergo a properly performed open radical prostatectomy. Minimally invasive surgery has always been about mimicking the open approach but reducing morbidity... isn't that what we are seeing here? Lower blood loss, less pain, shorter hospital stay and earlier recovery to physical activity are all important outcomes and give this study a positive result. In the UK it is the shorter hospital stay that makes the economics of robotic surgery just about viable. These factors are important for patients. The no difference in return to work is difficult to interpret as there are many socioeconomic factors that influence when patients start work, not just the type of operation and actual start time is not always easy to define. Previous data from the Karolinska has shown a marked difference in return to work although non randomised and in a more socialised environment. 5 unplanned admissions to ITU in the open group seem high, this should not be ignored. There doesn't seem to be any details of reasons for these admissions but if any contemporary robotic series reported 5 unplanned admissions in 150 cases it would be criticised, because this doesn't reach statistical significance doesn't mean these events are not significant, and I agree with Nathan Papa's thoughts. Knowledge of what these were for would be helpful. With regards to the trifecta, 12 weeks is too short for ED outcomes and we await the 24 month data, margin rates here are very low but are certainly related to experience and I echo the thoughts regarding the variations in surgeon experience. The continence data is more of a surprise as we have repeatedly seen an earlier recovery of continence in RALP series. Again surgeon experience will play a part, but also details on reconstruction techniques again would be helpful. It would be interesting to see JY RALP data since his transition. Stricker reported taking 700 RALP cases before matching functional outcomes of his high volume open series! Learning and then perfecting this surgery takes many many hundreds of cases. I've certainly enjoyed this blog, a big congratulations however to the Brisbane group for pulling this RCT off, well done!! This discussion has covered all the key ground--and I'd just add my congratulations again to the Brisbane team for getting an RCT done, albeit a flawed one. We should have had the cojones to do this in the U.S. about a dozen years ago. I think congrats are also due to Declan for a very well written and insightful blog post. It's a testament to his and the rest of the BJUI team's efforts that the quality here has risen this much—and that so many thought leaders from so many countries are engaged here! Though we had an editorial out on this question in JCO back in 2011, the same year in Urology I think Andrew Vickers pretty much nailed it with his title: "Great Meaningless Questions in Urology: Which Is Better, Open, Laparoscopic, or Robotic Radical Prostatectomy?" Surgeon proficiency (reflecting both learning curve and, we should be honest, variation in natural ability) will always remain a critical issue which ultimately trumps (can I still use that word??") the technological approach. 2. RARP reduces pain and improves recovery *slightly*. Admission times etc. are not a great metric since they are so driven by patient (and patient family) expectations. And back to work isn't great either—many men will take what time they can get off work. When I talked to Declan about this trial, he mentioned that "back to surfing" would have been a better endpoint in QLD! 4. RARP probably makes no difference in oncologic outcomes (despite Tewari 2012 on this one, I'd point to Barocas J Urol 2010: Jay Smith at Vanderbilt is one of the few surgeons that has done literally thousands both open and robot-assisted, and his margin rates were identical, even early in the learning curve). Surgeon factors dominate here. 5. RARP almost certainly does not itself improve urinary or sexual outcomes. Yes, there are meta-analyses suggesting this (Novara Eur Urol 2012), but those are heavily influenced by very-high volume RARP surgeons. Together with margin rates, this is the domain where skill and experience are ultimately what matters. I'd rather be anyone's open #1023 than robot #3. 6. We have no idea if the robot really does shorten learning curves. It's a technically demanding case no matter how you do it, and I believe everyone posting here is in the upper echelons of prostatectomy volumes. See Savage J Urol 2009 for the *real* problem: median annual prostatectomy volume in the US is 3 cases. Not 30, 3. Modal number is? 1. If you do 25 per year you're in the top 4%ile, and if you do 50, your in the top 2%ile. If you do 3 per year, it doesn't matter how you do them, it will take >8 years to even get your first 25 done, which appears to be the barest minimum for learning curve. And those low-volume surgeons unfortunately account for a huge proportion of the cases done every year. 7. For this reason, every surgeon should track his/her own outcomes systematically, every case, every time, including administration of patient-reported outcomes surveys. We're a ways off from this goal in the U.S., but we're making rapid progress (https://www.auanet.org/aqua). 8. RCTs are laudable, but must be considered in relation to other existing high-quality evidence, and must be considered in light of their own limitations (think PIVOT and PLCO). But we definitely need more RCTs in surgery to advance the field faster. 9. The Daily Telegraph needs to hire a new fact checker! I can't wait till the robot is better than me and I can just press "start" and go refill my coffee. 1. I don't think this trial is fallacious as is suggested by the headline. It is a very well conducted study, as might be expected for a randomised study published in Lancet. Sure it has imperfections as a clinical study must, but maybe its time to check the dictionary (deceptive, misleading ? = I don't think so). 2. For all of the criticism that a fault of the study is that GC has done only 200 RARP cases the study is actually a "better than real life" examination of this procedure. There has been a roughly 30% increase in the number of robot accredited surgeons in Victoria alone in the last 5 years, and most of them have done 800 cases to talk about our long learning curve but this is a level most urologist will never achieve simply due to case load and the increased number of urologists. Geoff's experience before this study is way beyond what most patients in the community can be certain of from their urologist. 3. To say a criticism of the paper is the JY and GC are not able to comment again is not logical. They are both grown men and if they feel something is incorrect then they will say so or continue to offer it tacit approval, as adults should do with any issue. The Stasi aren't looking over their shoulders. One aspect which could be improved is that their is a paucity of urologists under 40 and trainees contributing to this discussion, when they are a significant component of our community. Can this discussion be extended to the Online JC or another trainee chat room so that they can have their involvement encouraged? Great work getting this blog established. All good points Damien. I did consider it to be somewhat of a fallacy to consider this to be a true randomised assessment of the approach, such is the imbalance in surgeon experience. However I have now dropped this term from the sub-title of the blog to avoid confusion. Agree with most of the blog, however, after stating that 12 weeks is too early to study functional outcomes (it is indeed), it is unreasonable to make the following statement: "it does demonstrate that a much less experienced surgeon can actually deliver equivalent functional and oncological outcomes to a much more experienced surgeon, by adopting a robotic approach", based on the same (insufficient) 12 week outcome. It is either an irrealistic outcome point or not, and if it is, then also don't use it later on in the same text to make statements like these. It is likely that we will never get closer to the ‘perfect’ study design? Although the robotic approach seems similar to open at first sight, the difference in surgeon experience actually also allows to interpret this as an advantage for the robot. In line with retrospective comparative studies, the robotic approach so far does not seem to significantly impact oncological outcomes compared to the open approach. And as pointed out by Wouter Everaerts, the impact of this procedure is still huge whatever technique used, so very carefully making the indication is more important than choosing the technique. Still, the robot does seem to repeatedly show improvements in different secondary (shorter hospital stay, less blood loss, pain, complications (see Nathan Papa’s comments), etc.) as well as ‘tertiary; (teaching aspect, shorter learning curve, surgeon ergonomics, etc.) outcomes. But are these worth the extra burden on healthcare costs? The introduction of robo-urology has been a self-fulfilling prophecy (see comment by Homi Zargar), and going back to open is now nearly impossible. In the future, we will be obliged to study in a more standardized fashion whether new technologies actually reach predefined improvements. Only then higher costs can be justified and even more important, the influence of marketing and media on our practice can be minimized. An amazing amount of verbiage regarding a trial which has little or no relevance to contemporary prostatectomy practice . The lessons here are in the innate resistance to change by some surgeons. The robot is a better scalpel. If you were asked in 2002 " would you like to do this physically challenging surgery (RRP )with x12 vision magnification 3D bloodless field sitting in comfortable ergonomic environment overnight stay,no transfusion no bladder neck stricture ,same functional outcomes ? Improvements in surgery outcomes are incremental and here we have digitized our hand movements to do better procedures .I am not convinced the right questions were asked in this study. RCT's in surgery have a limited if any role. From a mere patient's point of view, my greatest despair is that uninformed journalists in business and popular magazines are so desperate for news-fluff stories that they seize upon any study report or gossip that might alarm and thus generate sales, views or ad revenue. To capture these venal rewards they need none of the intellectual or academic rigour that (should) occur in peer reviewed leading journals. Trouble is when mud is thrown, some sticks. Will we see next the same moronic attack on good medicine that we have seen from groups like the antivaxxers? As a patient who talks about his own unique experience, but in doing so gives his mates a heads-up, I have good friends, vital to their families as dads, husbands, brothers, who are confused by the mixed messages coming on prostate cancer. This gives some an excuse to put off a visit to their Doctor. Dissent is good. It makes people think and question. Articles like these in the Financial Review are shock stories without merit, but with a lot of danger. It takes considerable courage to present the results of a trial as they are, even when negative. The authors, our friends, deserve congratulations for completing and publishing these results in the Lancet. It is not the first time this has happened. Three negative trials involving robotic cystectomy with their own problems with design and power, a couple of years ago in the NEJM (Bochner), Eur Urol (Khan, Dasgupta) and BJUI (Parekh) led me to pen the BJUI Blog entitled "Surgical Science - everything is not what it seems". The message seems to be - "An experienced surgeon is often more important than expensive technology"
May I point out an issue with the quoted positive margin rates which seemed too good to be true. The wrong denominator has been used. From table 2 in the paper it is clear that the number of pT2 and pT3 (ie no ECE or ECE) are as follows: Open pT2=102 and pT3=49 with the Robotic group being pT2=102 and pT3=55. This is a different story. The differences are still not statistically different. The open rates are the best I have ever seen quoted in the literature and indicate a very high quality of open surgery. That the Robotic technique can give an equivalent result with less bleeding, shorter hospital stay and less pain than open surgery carried out by a gifted and highly experienced surgeon speaks volumes for the Robot. Couldn't agree more, Laurence Harewood. I don't understand why some people are saying this shows the robot isn't better than open surgery. It's practically impossible to have better margin rates than in this open series, yet, as you say, the robotic group shows significantly less trauma to the patient, and less time in hospital. Am I confused somehow, but to me this is a great benefit. It's how you interpret the results, or expectations of results. Perhaps we are seeing some media 'spin' on this? I was shown this by one of my Professorial colleagues in radiology yesterday and only then realised that I was the poster boy, as the featured photograph in the paper version of the BMJ was of me holding on to a robotic 3D telescope. Hasten to add that I have no conflicts of interest and did not write the article or submit the photograph. The view expressed by the BMJ is independent and shows that this nice trial will be interpreted in academic circles in various different ways. As several people have already highlighted randomised trials in surgery are extremely difficult to undertake and complete. The authors of this study are therefore to be congratulated on their accomplishment. However, the blog discussion perhaps highlights why we might consider alternative ways of assessing new surgical therapies as RCTs are so difficult. Large databases of surgical outcome are perhaps part of the solution - The BAUS, AUA and Movember True Nth datasets being examples of how a combination of surgeon and patient reported outcomes could provide us with an understanding of the variance between techniques and surgeons. Such data can allow us to set minimum standards, which is what matters to the majority of patients, rather than focussing on the outcomes of excellent surgeons (as seen in the results of this trial). Once minimum standards are agreed they can be audited against and revised as new technologies come along. The datasets would also provide a backdrop against which we can assess new technologies. Let's support the collection of these outcome data and seek to agree and define the minimum standards. Excellent job done Declan , as usual. The blog was to the point, and it dissected every crucial aspect of this study . More fascinating aspect was the the comments by the experts especially Jay Smith, Hein Von Popple, Tony Costello and Prokar. As Matt Cooperberg mentioned, it is meaningless to compare open vs lap vs robotic prostatectomy, a good prostatectomy is what results in good outcome, come what may be the approach. I entirely agree with Hein Von Popple, that it would be interesting to see the outcomes in high risk prostate cancer comparing open vs robotic. We will be doing more and more RP for this group in coming years as low risk and very low risk Cap would still be treated with AS or local therapy (despite the results of LAPPRO trial). I am sure Hein would not get (ab)used in defending this scenario. Enjoyed all the comments and the blog. keep it up. Well done Declan on a great blog. The authors John Yaxley and Geoff Coughlin ought to be congratulated for reporting this trial but as discussed by many contributors we need to compare like with like. We are all aware that the experience of the surgeon is the single most important independent factor in operative outcomes. Despite using 12 weeks as an end point this study does demonstrate that a less experienced surgeon using the robot can achieve similar results to a surgeon with many more years experience which is something we have all experienced having moved from years of open surgery to RARP i.e. less experienced surgeon + robot = experienced surgeon. Many of us who have performed open surgery for many years and have transitioned to RARP in the last few years know that our own outcomes from RARP are generally better than our own historic open controls. I stopped performing ORP a few years ago and have no intention of going back as I feel that my patients are best served by RARP. I would have reverted back to open surgery if I felt that my outcomes were inferior. Very few trainees are performing ORP so as such the ship has already sailed. It is interesting to note that John Yaxley is now performing RARP.